Grand Opening of Vintage Threads Inc.
Vintage Threads Inc. is open for business. There are lots of items there, and I will try to update at least ever two weeks. I am also waiting on more inventory from other artists to place in the store. 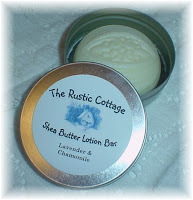 Soon there will be hand-made lotions, soaps and other potions like that. I really like this lotion; I purchased some from the maker about 1 year ago for my daughter. I was having a hard time finding a lotion I could use on my kids because they all have very bad eczema. I know it did wonders for my oldest on helping her skin not to have ruff scaly patches, and it kept it from cracking. The one we purchased was the chamomile and lavender bar of lotion. So, I wanted to carry this in the store because it is handmade and helps my daughters a lot. That should be in the store in the next two weeks . There are other items I am expecting, too. I will let those be a surprise to you until I post them in the store. When it asks for a coupon type in Sunshine; this is only good for today, Tuesday and Wednesday. It will give you 5% off purchase your total purchase, before tax and shipping. 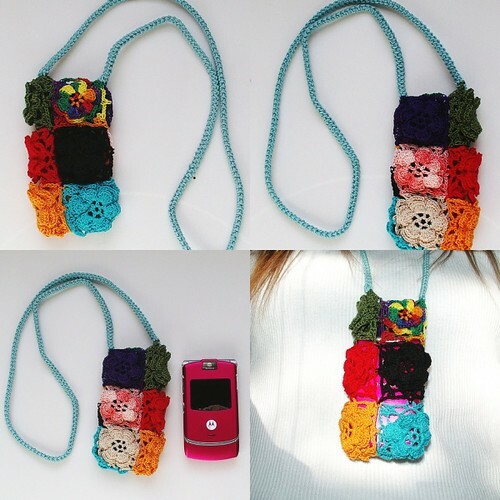 RAZR Flower Cozy, originally uploaded by sunshine's creations. 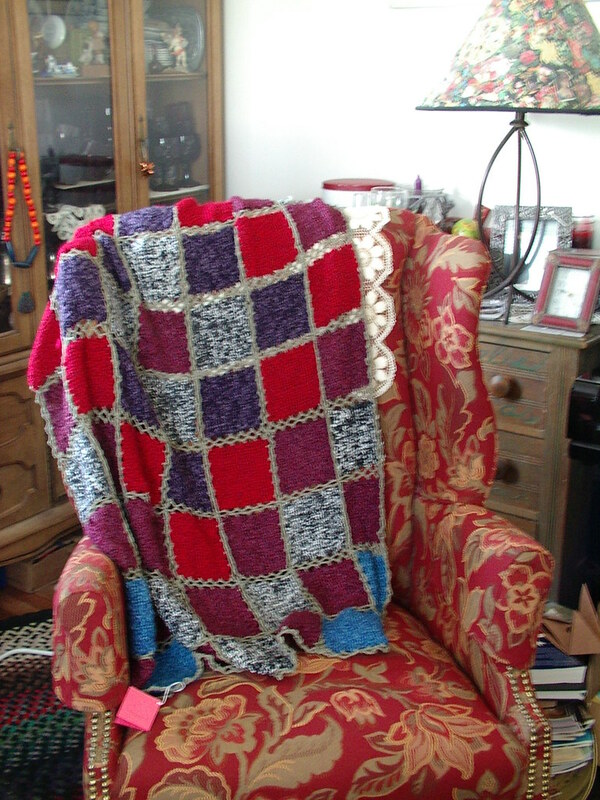 I was thinking of something to do for whiplash and I was inspired by a blanket I was making with Irish roses. I thought the roses might give the phone a buffer from getting scratched and dropped. Two doll/wall quilts I have made for the store. I have wondered for awhile how people get pictures on explore. Today I noticed I had two. "Cool," I thought, "but how do I figure out which ones they are?" So I set out searching; with over 500 photos, I wasn't sure where to begin so I started by checking my most popular photos. I figured out that it goes by the date you uploaded the photo. So I checked a few of those, but that was way to much work to look at over 500 photos for each day to see if I had one in there. After about two hours I figured, "Well, fd's Flickr Toys that I used to make the profile widget flickr bar above of my photos knows how to find it or it wouldn't be on my bar." So I went to their site and looked around; sure enough, they have a tool called scout which finds them for you. Boy, that was much easier; it was not hard to find them, then. So, if you are like me and wanted to know which ones, also if you didn't know how to find out if you had some and which they where, I hope this helps you. I have posted them here for you to see, too. I actually guessed the orange one and I figured it was a felt ornament for the other; I was just not sure if it was the heart, dove1 , dove2 or snowman, at first. I know why they interest me, but I have no idea why this was interesting to people on flickr. 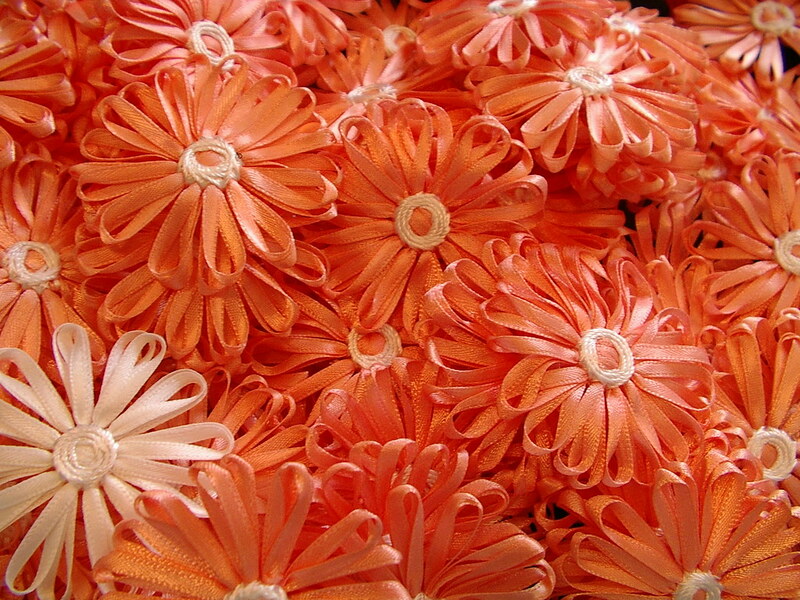 I have a tutorial on how to make the orange daisies and how to make a felt ornament if you want to make some, too. The funny thing about explore is that it changes from day to day so one day you may have 4 and the next none. As other people who uploaded on that day may have more views and such all of a sudden and bump you off the list. One of those things you are waiting for months to see but don't have it yet and others do. Not a problem I am good with that; it is just I thought my deadline was May 1st and it happened 2 days ago. Of course, May 1 didn't happen two days ago, but the arrival of the first books in homes; the publisher was early. Time flies when you are busy. I am supposed to have a small write up in this book about my head wraps, and as an editor. I would really love to see it, but my copies have yet to arrive. Oh, well, I can wait; I have plenty to do, like work on the store and items for it. If you didn't notice, the blog site address has changes from blogspot to vintagethreads, which just happens to match my store name. My husband did that for me last night. So there was an hour last night that you could not find my blog; that would be why it was dancing in cyber space somewhere for an hour without a real home. Meaning he linked to a spot before he finished making the spot, so the link went to nowhere. He is so cool! He realized this mistake right away and fixed it. I think it is just so neat to have it say vintage threads. OK! I know it is weird, but it just seems more mine and not so much blogspots. I made a few bonnets for the store. My husband tells me it will be functioning in just a few days. Boy, can we say I have store on the brain! It is all I can think about lately. I wanted it done already, and so did he, but with the kid sick so much lately thing got a little behind. 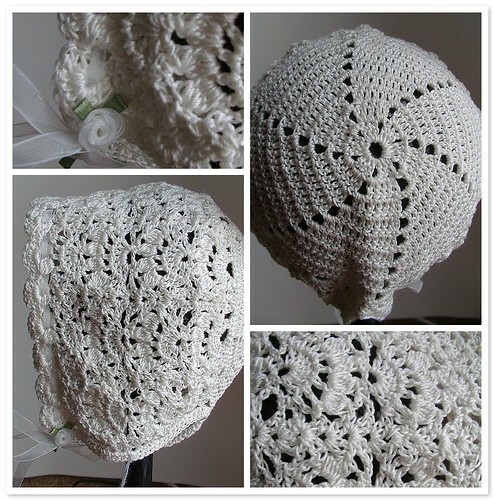 So you can see a few things that will be in the store, here are two bonnets that will be there. 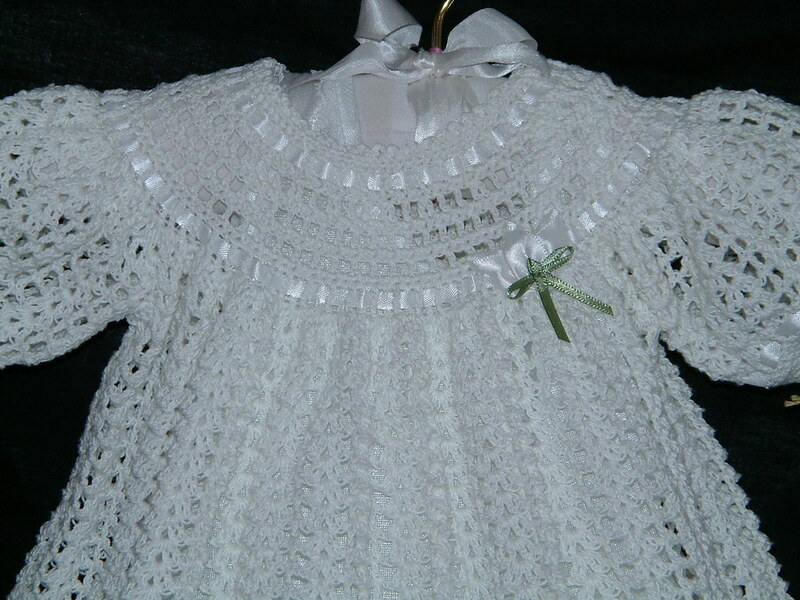 I really like the white one; it is for a baby from 9-12 months. I liked using bonnets on my kids, especially when they are a little older; it just gives a finished look to a nice holiday-type outfit. The mauve is made out of 30%linen and 70% viscose (rayon). 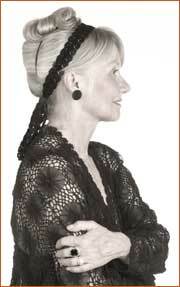 This makes for a real soft and fuzzy bonnet that's very nice to touch. My daughter finished her needle punch today. I thought she would have had it finished yesterday, but she burned out a little. Not bad for three days' work. I also finished a repair project I had been putting off due to time and sick kids. I repaired seven alter clothes this morning for my church. Then I drove 20 miles to return them and discovered I had two more to repair, so as soon as I got home I repaired the other two. This time I don't want to be behind. I will deliver them this week. Two things we are ahead of right now. Trust me, that is amazing because I feel behind on everything at the moment. My oldest daughter has a take-home assignment from her art class at school. During the semester she is supposed to make an item that shows at least one hour of work. She is up to eight hours of work on this so far and I think she will finish it today. This is how she wanted to spend Spring Break. Learning a new skill. She was upset when it was her younger sister learning how for a take-home assignment and not her. So when it came time for her do her take-home, she asked to learn what her sister had learned. I think children as young as five can learn how to do this if you thread the needle for them. Older children can thread the needle themselves. The design she came up with herself. We discussed a few things then I handed her a post-it note tablet and let her draw her design. 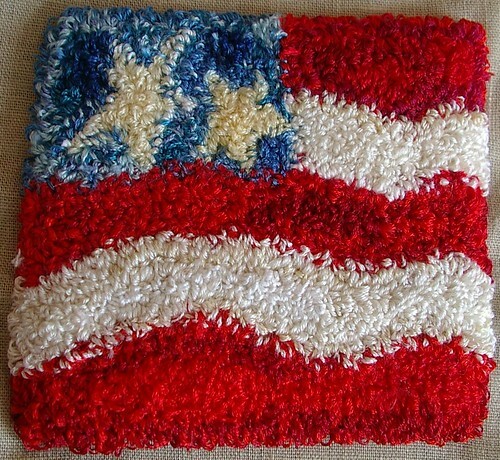 If you do this, remember on the fabric the image is drawn on the back of the work and has to be a mirror image or something like a flag will be backward and so will words if you don't plan ahead. 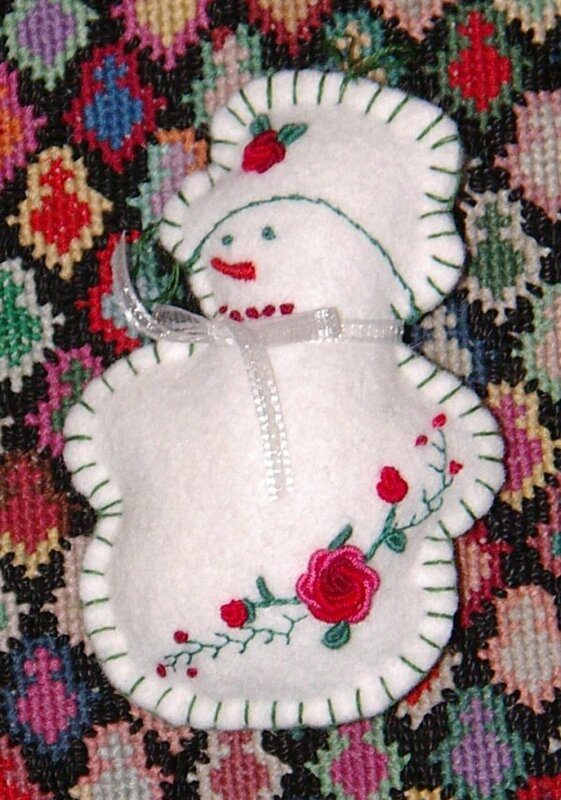 To see all the Russian needle punch that both daughters and myself have posted thus far, go here. If you want to view just the photos and not the stories that go with them, go here on flickr. 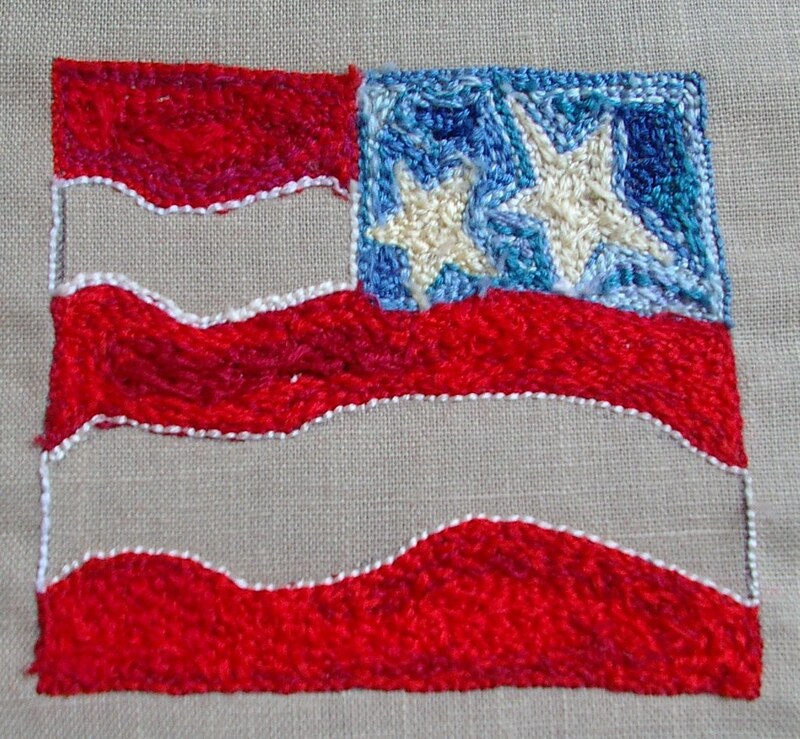 I also started a group today if you do this type of needle work I would love to see it join the group and add your photos. Of hair wraps. Lots of colors and sizes too. All are ready to put in the store. 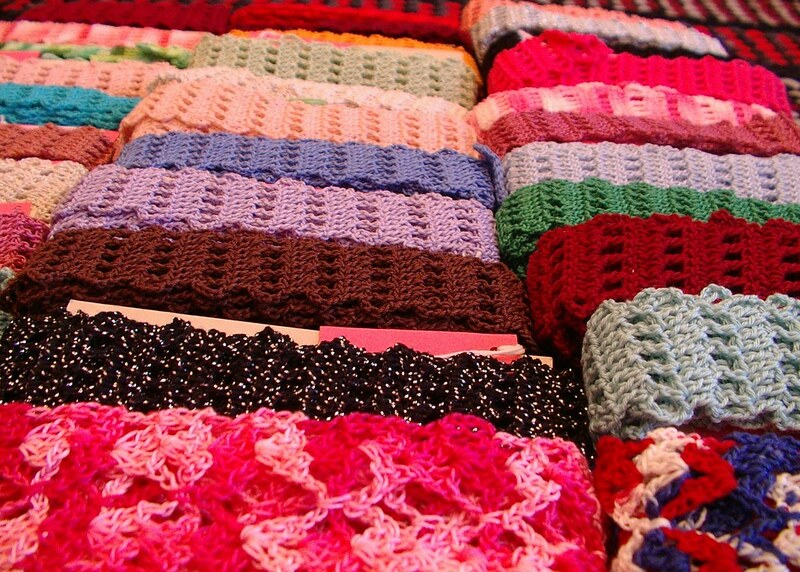 I am still making more in different colors and patterns; there will be three lengths and four different patterns to choose from. 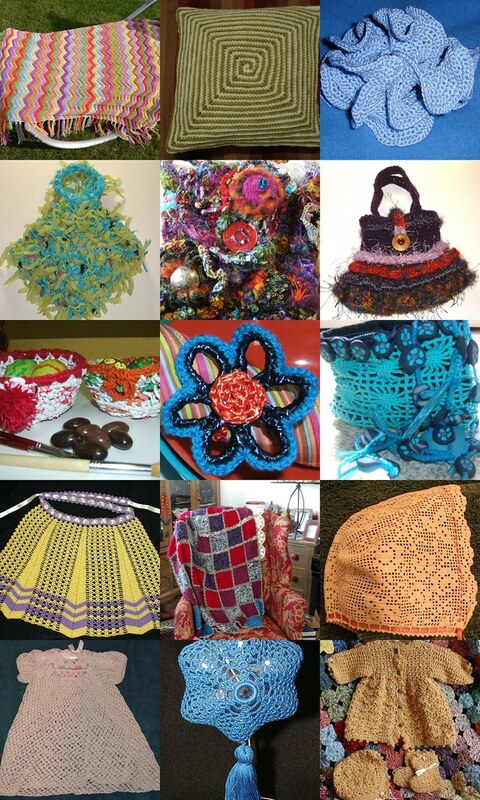 All these are made with vintage to antique crochet thread. Meaning on the labels that came with the threads it read boil fast not color fast. Because people used to boil their clothes to get them clean, you didn't want the dyes coming out in the boiling water so they were called boil fast. Some of the threads are over 100 years old. They are still strong and sturdy for use. The lengths are 40 inches, 60 inches and 80 inches. 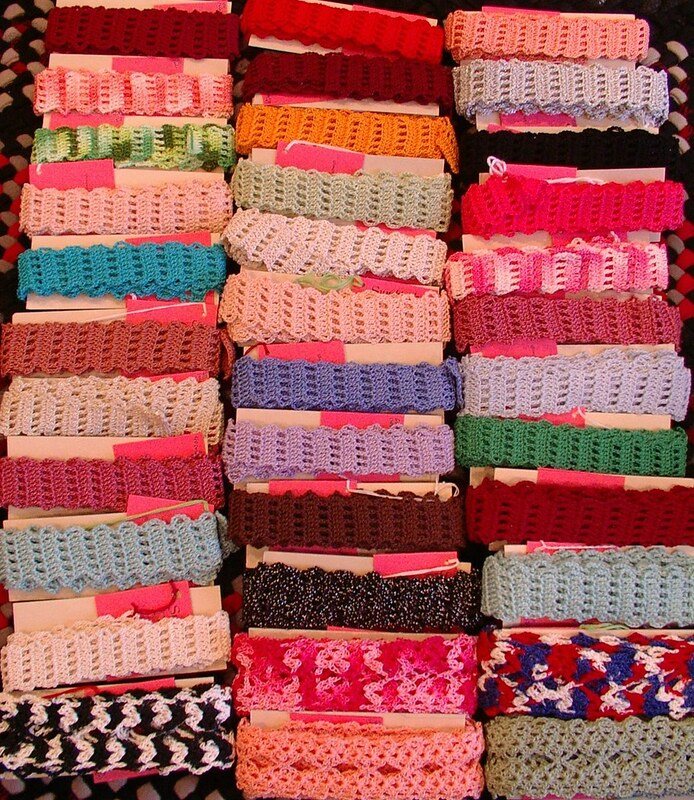 The way the length was determined for each head wrap was by how much vintage thread I had. If I had a complete ball, I would make a long one; if I had partial balls of thread, then it would end up as a medium or short length. Since these threads come from estate sales, thrift stores and antique stores, once I use a color to make a head wrap I won't be able to get it again because most are not even companies that exist anymore. 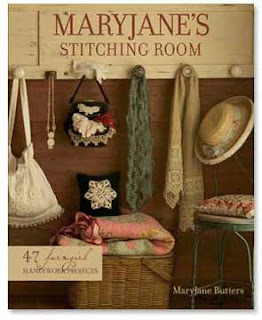 So to me, each is a one-of-a-kind made with vintage thread on vintage hooks. When the store opens all of these plus more will be available. There will also be items from other artisans -- all handmade. Today in the mail I got a gift from Sid. 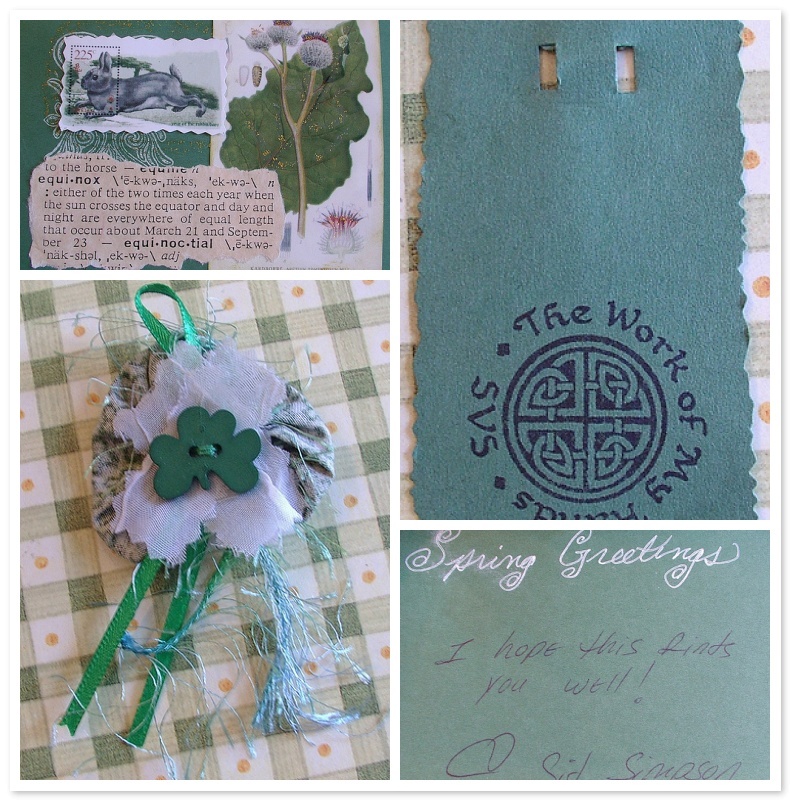 After St. Patrick's Day I saw some pins on flickr that she made for her co-workers. I commented on them, that I liked them. She was so sweet and sent me one. Funny, it arrived on the 17th of April -- one month to the day after St. Patrick's Day; how's that for timing. She made the tag and card herself, too. Penny over at Penny Sanford Porcelains sent me the loveliest brooch/charm I have seen made out of Porcelain. She makes these herself. She gave this to me as an award titled "The Happy Penny Award". I think it is very sweet. I love that she is doing hand work because I do tons of that. Penny does sell these; if you are interested, follow links to her site. When we went to my in-laws for a late Easter egg hunt, my mother-in-law gave me a birthday present. I think it is so cool; I just wish I had a little bit of time to sit down and play with it. Life is so busy at the current time. I really love this item; I discovered the other day that in Japan they sell a larger and smaller version of this and also heart and flower ones, too. I just can't figure out how to order them yet. 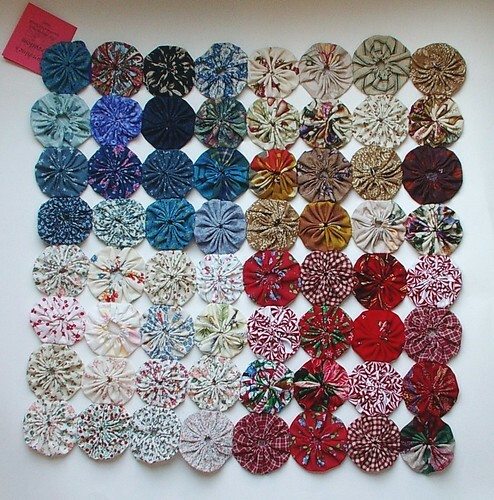 I was in a fat-quarter swap at MJF forum with nine other women. 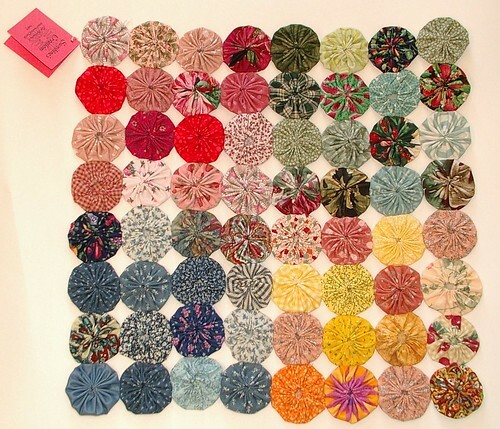 The fat quarter I sent in is the third from left; it is a vintage fabric my Vavo purchased. It's always fun to see the variety you get in a swap -- thanks, ladies! Suzy homemaker who is also at MJF sent me this lovely Easter card with a fat quarter of fabric. I am going to have so much fun with fabric in the near future. 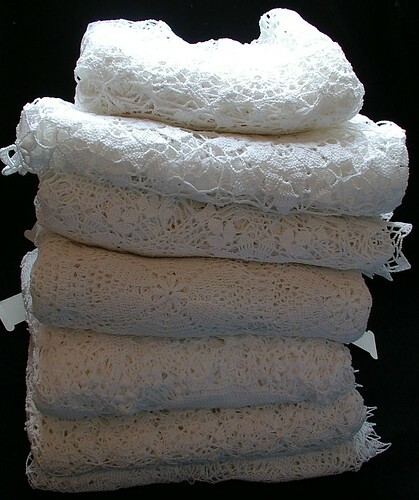 I love this fabric; it is so soft and delicate looking. Would be lovely as a Mother's Day item. Hmm... I might think on that one a little. I have a few more items to show and say thank you for; I just didn't have time to photograph them all, so you will probably see them later. A box and envelope of fabric from levisgrammy at MJF. Also a box from This Vintage Chica with real cute items in it. This is the box and envelope of fabric from levisgrammy at MJF. 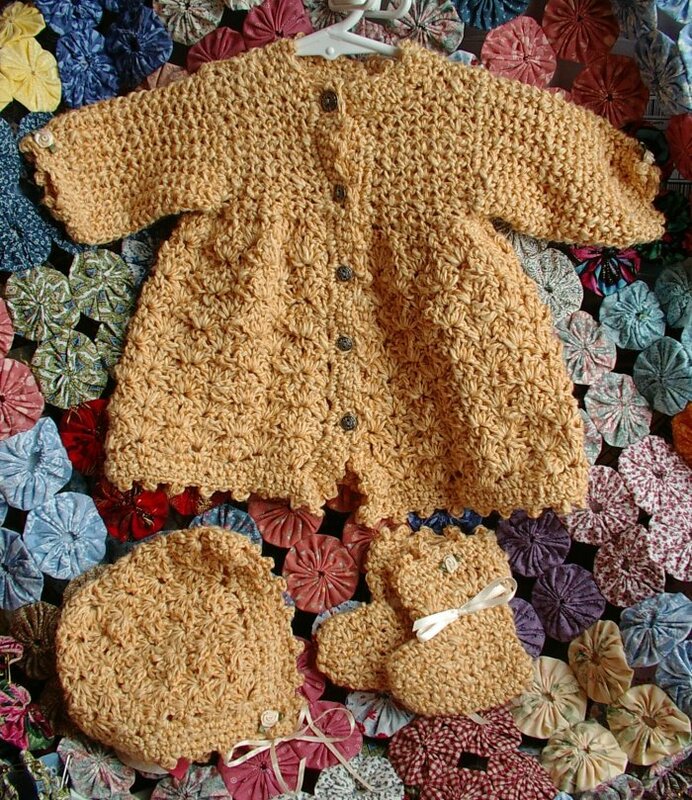 This stuff below are the items from "This Vintage Chica" and an apron from her, too. I still need to send her fabric and yarn for the exchange; sorry I'm so long in doing this. I just love roosters; aren't those just the cutest plates. The white sheer item is a curtain that I may make into an apron later after I get a chance to try and remove the stain. I knew about the stain before she sent it. I think it will still work out lovely. This is one of those times when I wish I had a mannequin or dress form or something to drape clothes on; this is real cute and the lighting didn't do it justice nor did laying it on the floor. It is a vintage apron, but the colors are still popular today. 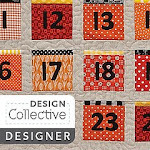 I would love to make a quilt someday in this color scheme. This is about three shades of pink and three shades of chocolate; it's hard to see in this photo -- bad lighting. But super super cute!! Did you know the Easter bunny can fly?! We just finished Easter today! 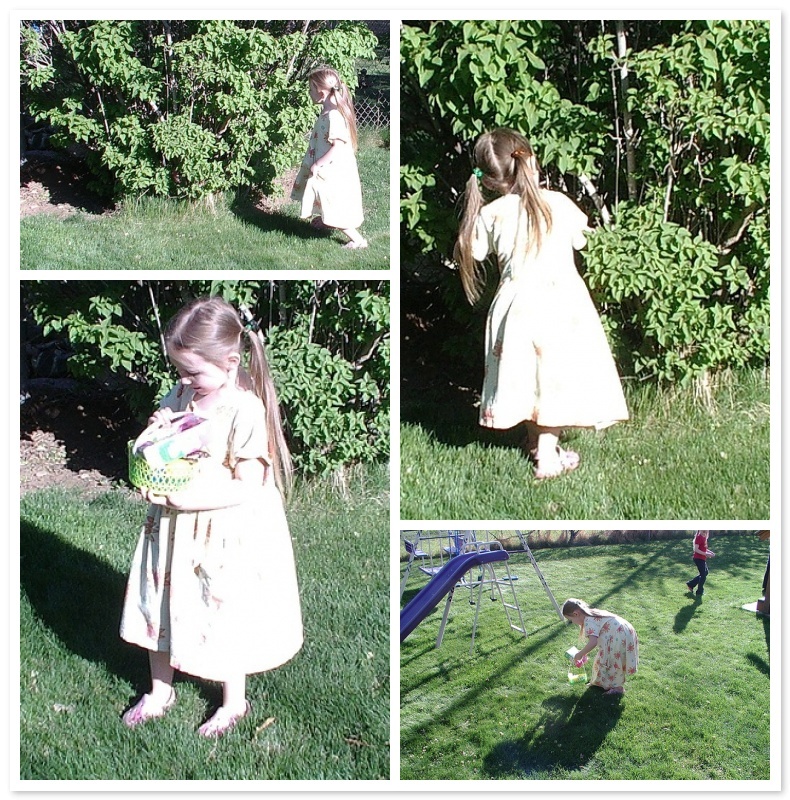 We did Easter in California where I grew up on Easter Sunday. We did Easter in Utah today where my husband grew up. In California it is more of an egg roll and kids nine and under hunt. In Utah it is everyone hunting and I think the Easter bunny has wings and a very weird sense of humor. My husband tells stories of the Easter bunny hiding eggs at the bottom of the flour bucket in the kitchen when he was a kid so you had to empty the entire bucket to find your egg. 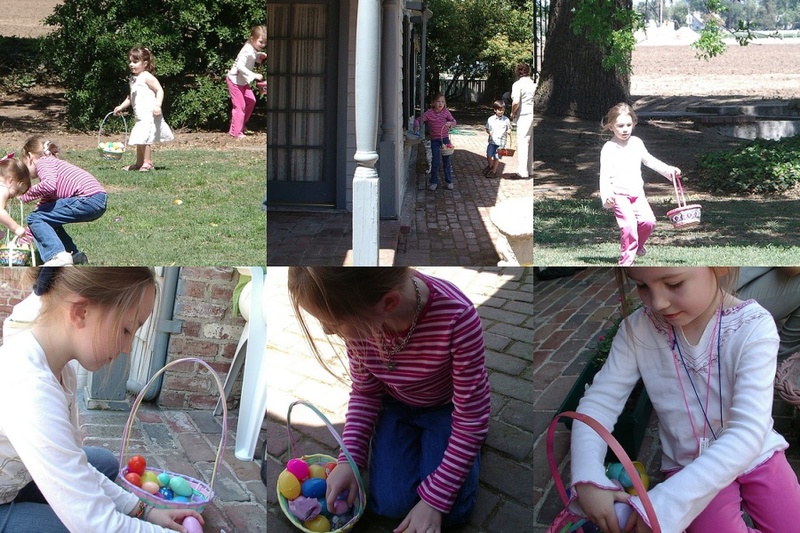 This year the kids had to find 4 plastic eggs and two boiled ones and a basket. My husband and I had to find 1 boiled egg each and 1 basket between us. You would think this would be done in a matter of minutes; try 2 hours later we finally find all but one egg and we found one egg from the previous hunt a week ago when all the cousins did their hunt. 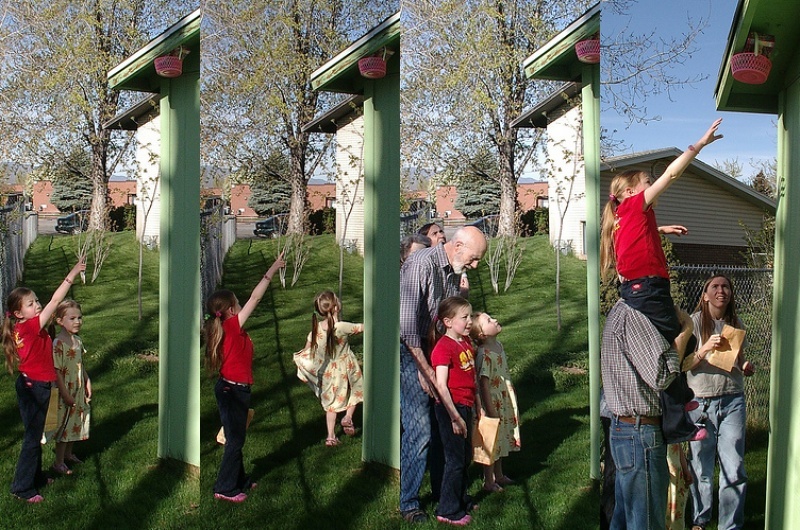 Not to mention the week prior the cousins found an egg that was hidden the year before. That Easter bunny hides eggs way to well! There was one egg we couldn't find -- a plastic one. So if any cousins read this, there is still an egg hiding in grandma's yard. If you find it, you can have it. 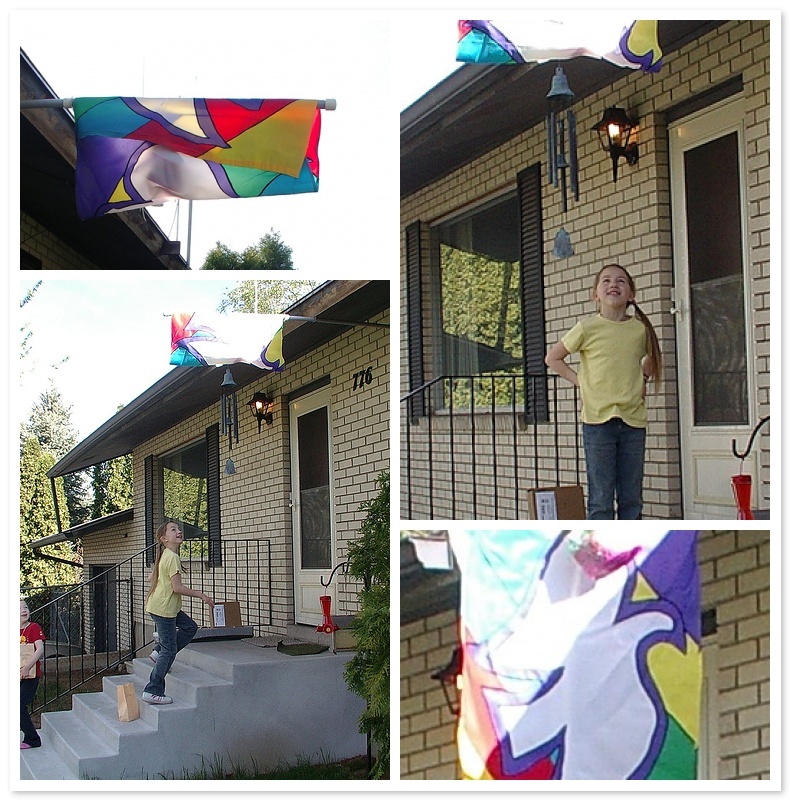 As you can tell this one was hidden on the flag pole wrapped in a banner. You could only see it very well from one side when the light was shining through it. Try to figure out how the bunny got up and how the kid is supposed to get it down. 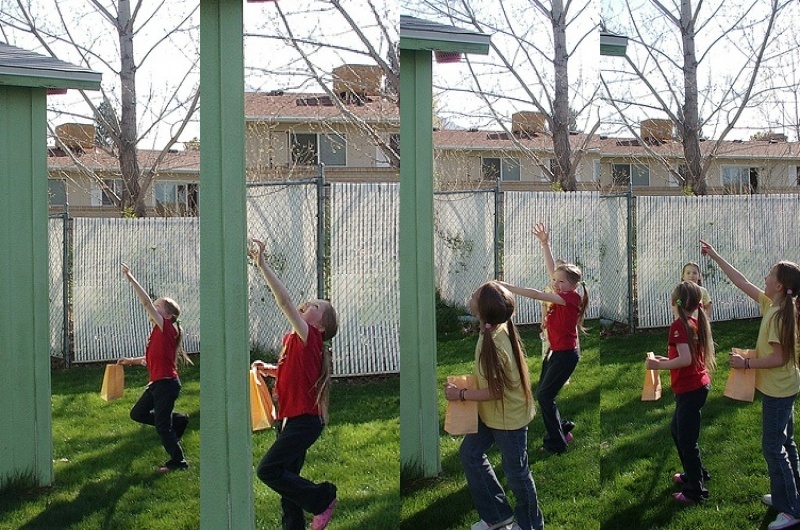 If you think being a little kid will make it easier to find your basket, you're wrong. You may find it, but getting it is not as easy as it may look. May have to hire help on this one. Call in Grandpa. As you can tell, it is not an easy hunt if you are a kid. 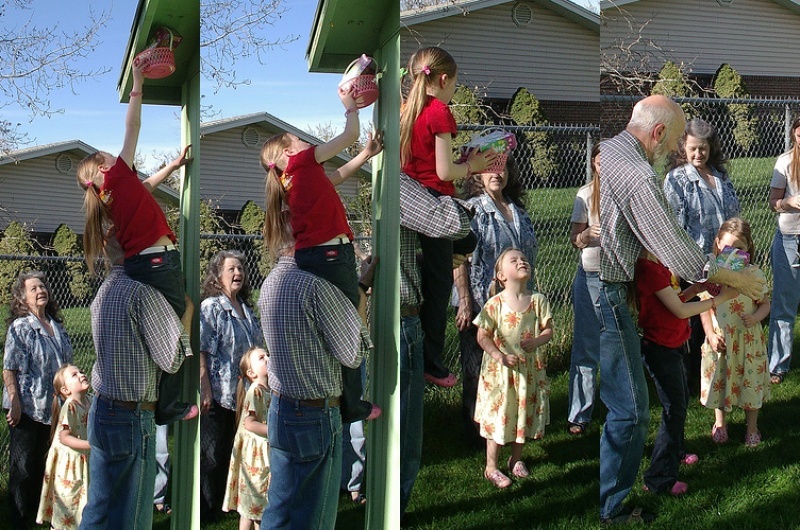 Now if you are a toddler or preschooler, not so bad to find the basket low to the ground, but the egg hunt -- that is the real hard part still because adults and kids are looking for the same eggs. Oh course, the littlest daughter thinks she is a real big girl because no one had to help her get her basket down. Unlike sisters and Mae (pronounced My means "Mom" in Portuguese). Side note: mine was in the top of a bush about 4 feet above my reach. I just looked at my husband and said, "It is yours, too, so I will let you can get it down." We had a lot of fun and all got a little bit of a sun burn too. You wouldn't think that would happen at 9 a.m. Weird weather. What temp do you have? or Worlds tallest thermometer. We actually went to California for Easter. It wasn't something mentioned on the blog. We left on the 4th and came back on the 9th, a very quick trip to say the least. Took two days to get there, stopping to see my sister, and a 14-hour drive home, it is only supposed to be 11 hours (only, yikes)! Construction outside of Barstow -- yuck!!!!!! We stopped in Baker on the way out and back to give the kids a rest. I always forget to take a picture of that town's major landmark, so this time I thought I would. As you can see, it is a very large thermometer. If you look at the upper right picture closely (click on it) it reads 81 degrees Fahrenheit; yep, definitely near Death Valley. It is hard to tell in these pictures how tall this item is; I hope the cars give you a reference. 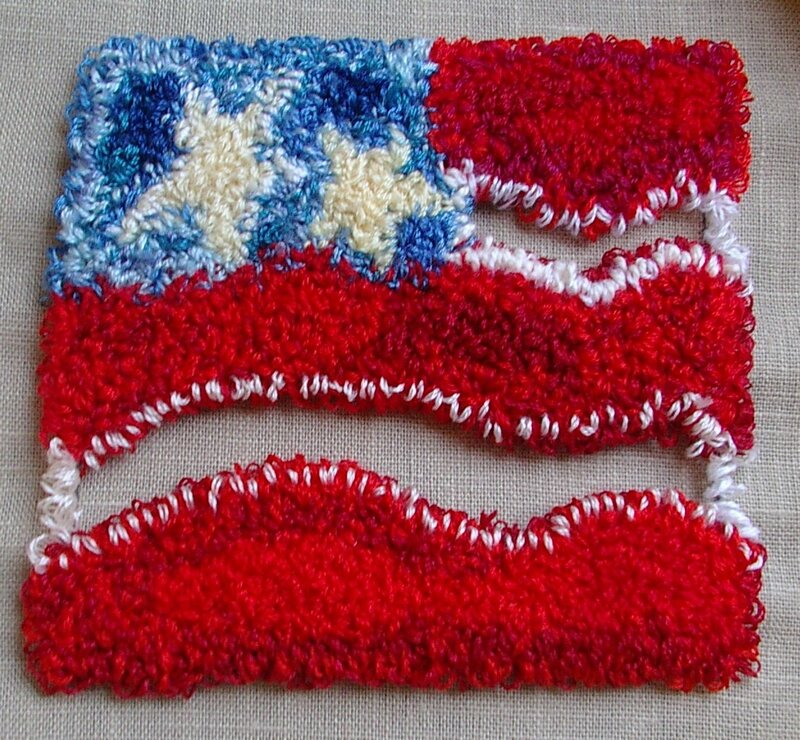 If you love crochet -- making, using or just collecting -- there is a new group on flickr you want to check out. 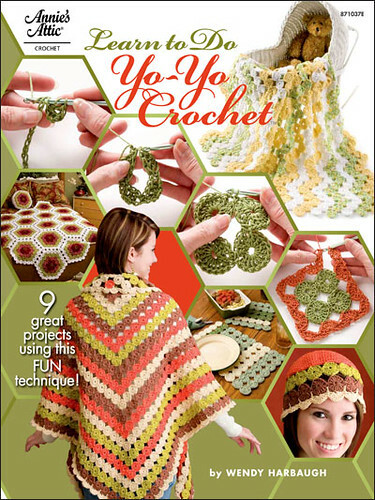 It is called Hooked on Crochet. 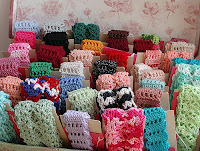 Any crochet items from baby clothes, blankets, or purses, vintage, new, or still making, please add them all to this group. This is a family-friendly group, so anything that a child shouldn't see shouldn't be added to the group. Enjoy looking forward to all the wonderful creations out there in cyber-land. Last summer we had a few friends die in a plane crash. All three men left behind wives and children and unborn babies. 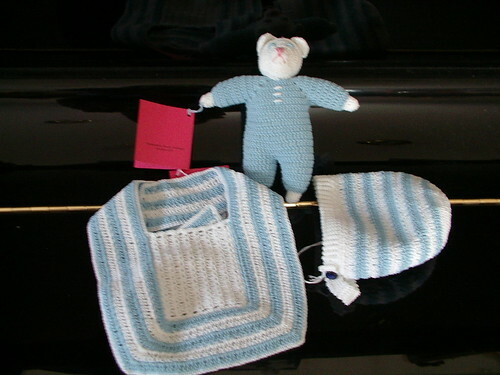 As each baby has been born, I have made a special one-of-a-kind item for that child. This is the last baby of those wonderful men. There have been two little girls and one little boy. This is for the second little girl; she is now 3 months old. This set fits 3 months to 6 months old. The top picture is of the complete 4-piece set. The next three are of the jacket, close up of the jacket buttons and rose on sleeves. 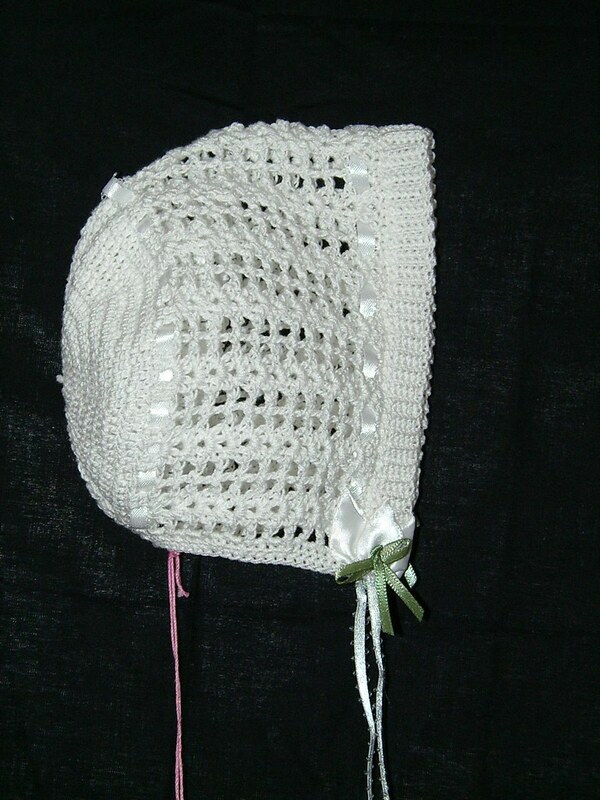 The last three are of the booties, bonnet, and a close up of bonnet detail. Click on pictures for bigger image. The items below are what the other babies received as gifts as they arrived. I really enjoyed this labor of love making these items for our friends. I hope that they will in time be cherished items in these families and passed down for many generations to come. The blue items below and the blanket went to the only boy in the group. 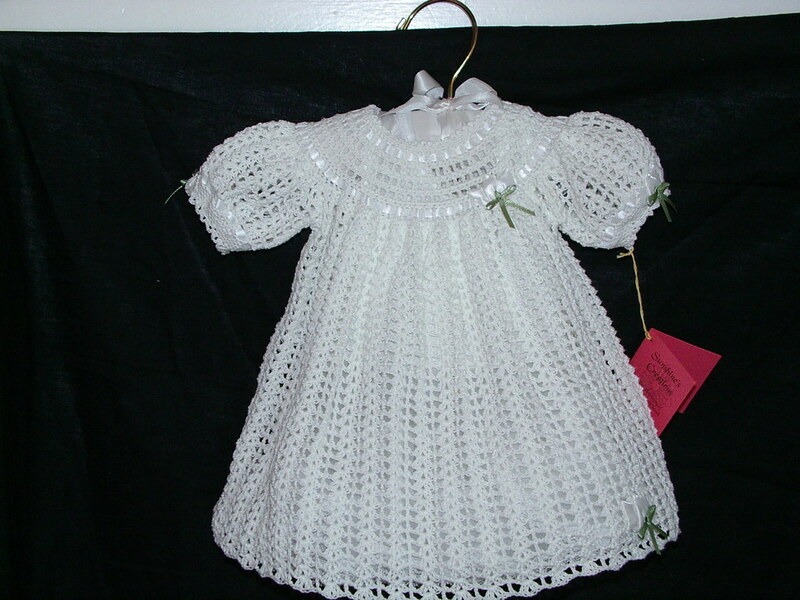 This is the dress and bonnet that went to the other little baby girl in the group. Since Easter just happened I thought this was fitting to show today. 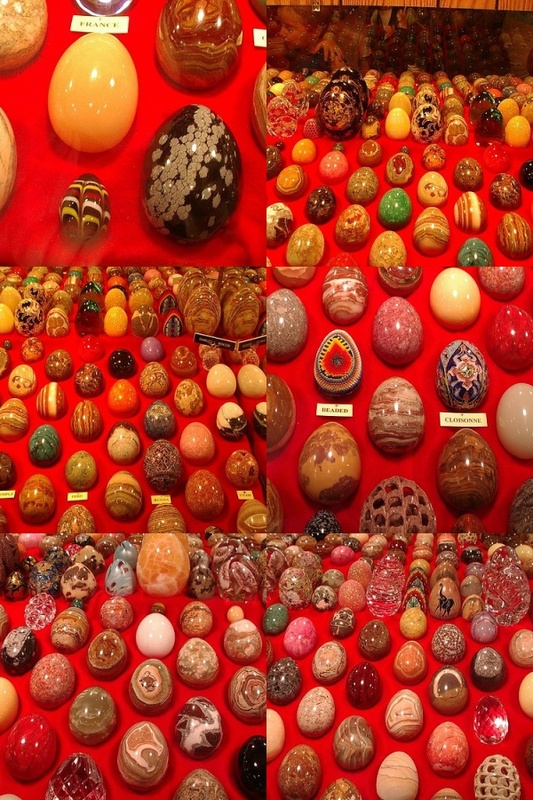 This is an egg display at the rock show. I thought this was a lovely array of eggs. I especially like the lamp work ones and the snowflake obsidian. There was another lovely display of carved stone. This other one was of carved elephants. The glowing rocks were real neat; it took me awhile to figure out how to take good pictures in the dark that were not blurry since I didn't bring a tri-pod. So I held the camera up to the glass to steady it for the long exposure; I think they came out well. These are all under black light. There were lots of other displays as well, like this miniature train display. To see how small this is, that is a 5 year old's finger in the bottom picture. 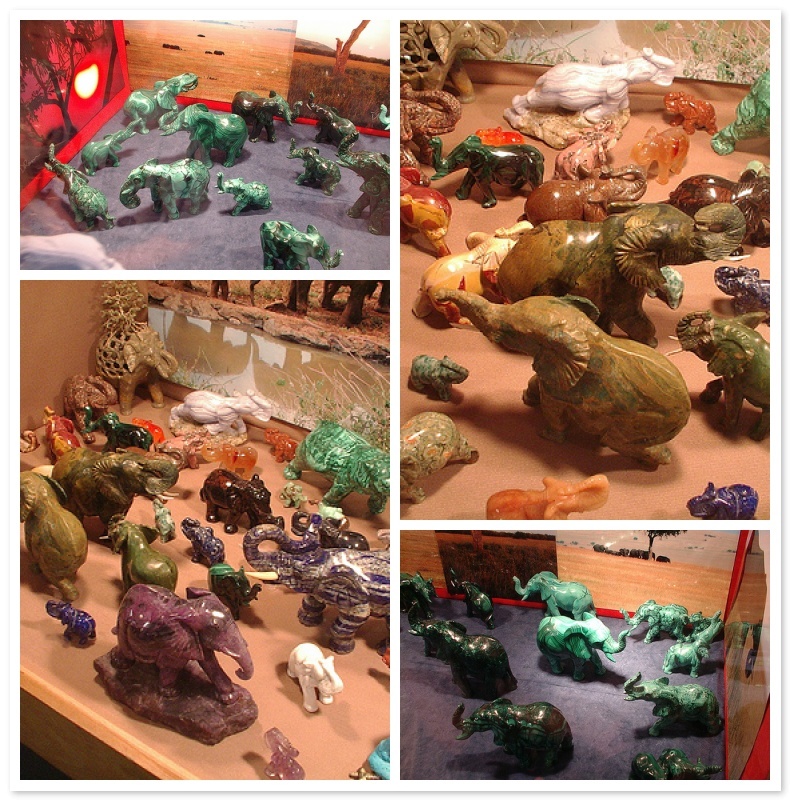 Also, there were petrified wood and carved and polished metamorphic rocks, geodes, petrified turtles (fossil), and rocks carved into spheres. Lastly, the thing I don't think I will ever understand, and it is gross to me, is stones bladed into knives with animal jawbones for the handle. Impractical as you could never hold it comfortably and absolutely discusting to me.